Successfully Added Radio Control Amphibious Transformer Toy RC Tank (220V) to your Shopping Cart. Radio Control Amphibious Transformer Toy RC Tank for kids of all ages! 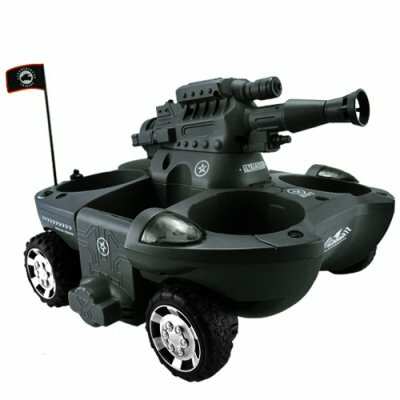 Watch your child's eyes light up when you give them this great land and water thundering RC tank. The remote control gives you dual thumb control for true 8-directional movement as well as access to two special tactical buttons. The left one transforms the land tank to a water battleship in an instant by retracting those fat studded tires, but be careful with that right button though. Press it and you'll launch a world of hurt on your enemies - volley after volley of hard tiny pellets! also makes it the perfect beer fetching robot. Here's how it works. You're watching the Redskins play the Dolphins. You're out of beer. You yell over to the kitchen, "hey Honey, grab me a beer will ya!" She shouts back, "I'm on the phone, get it yourself!" All you have to do is remote control this RC tank over to the kitchen so she can fill up all four compartments with your favorite nector beverage. Then you just remote control drive it back for some sudsy refreshment and the rest of the game. Don't delay, click "add to cart" right away for the child in your life or the child inside you. Either way, you're getting a great RC toy at an even greater price from the leader in online wholesale electronics - Chinavasion! Can this RC tank be used outdoors? YES. It loves the outdoors. YES. It is an amphibious vehicle and has an underside which protects it from water. It should NOT however be used while it is raining, or else water could get into the battery housing on the top of the tank and ruin the inner circuitry. Does the antenna of the RC remote have to be fully extended to get the most out of operating range? Yes, though you can adjust the antenna to suit how you want to operate the RC vehicle since there is not always a need to fully extend the antenna. What type of beer can this tank carry? Well, all beers really, but it loves real beer, from GERMANY!